There was already a buzz in the offices and hallways at Northside, what with a state championship game coming up. It picked up a little bit Tuesday morning. Students were in line to cough up $20 for the bus and ticket to Friday’s GHSA Class AAAAA title game at the Georgia Dome against Mays. For many, there was no coughing up of a precious $20. Abry Jones covered it. The former Northside standout and current Jacksonville Jaguars defensive end arranged to pick up the tab for a large chunk of students. Jennifer Dollar of Northside’s bookkeeping and ticket office said Jones bought 150 tickets. The game ticket was $18, and the school is charging students only $2 of the $17 bus-ride cost. So Jones was good for a $3,000 Christmas present. Jones graduated in 2009, after a load of honors for his 2008 season, such as Associated Press defensive player of the year, consensus first-team all-state picks as well as an All-Middle Georgia selection. He started 26 games at Georgia, where he was voted the most improved player as a junior and won the team’s David Jacobs award for portraying “courage, spirit, character and determination,” as the award states. 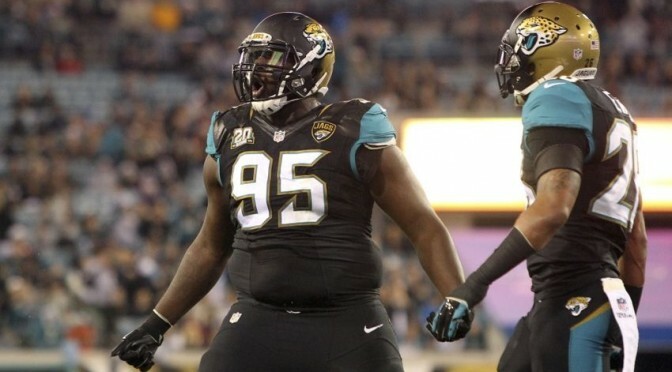 He was signed by Jacksonville as an undrafted free agent in 2013 and has played in 13 games this season. Jones’ Twitter feed, @JUSTAB3, is loaded with Northside items, including pictures of the scoreboard after last week’s semifinal win over Allatoona, as well as after the playoff win over Dalton and a picture of him at McConnell-Talbert Stadium for the first-round game against Northside-Columbus ... wearing a Northside letterman’s jacket.